From the discovery of gravitational waves to the building evidence that a massive planet could exist beyond Pluto, it has been a thrilling year for astronomy news. We recap. 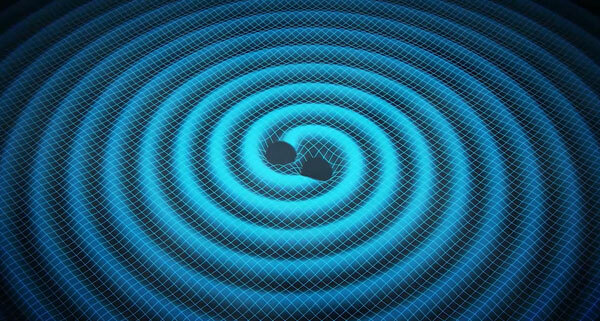 When two black holes twirl in a mutual orbit, they radiate gravitational waves, leaking orbital energy and spiraling in toward each other. This artist's concept portrays the radiating ripples on a 2D spacetime surface so we can better imagine it. The discovery made headlines worldwide and even appeared on The Late Show with Stephen Colbert. 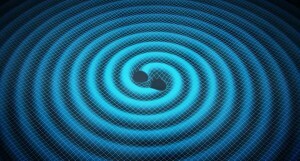 After more than a half-century of searching, physicists finally detected gravitational waves — ripples in the fabric of spacetime — from two colliding black holes. Scientists went wild. But gravitational waves weren’t the only news that made 2016 a truly momentous year in astronomy. Scientists also discovered thousands of new worlds (one so close we could reach it in 4.2 years if we traveled at the speed of light) and launched missions to nearby solar system planets. Although these stories easily top our “greatest hits” list below, not all stories arrive with such a crashing impact that they immediately change how we perceive the universe. Most unfold slowly. Those stories are the ones that are truest to the scientific process as it zigzags toward the truth. So as we review 2016’s top astronomy news stories, we’ll also review milestones, including a new data release that’s bound to remap the galaxy, and other tales of unsteady progress, such as changes in our thinking on dark matter. It’s worth mentioning that 2016 also pulled the Moon a tad closer to Earth, revealing a supermoon that caused a ruckus of responses. And it pushed a few notable people away from us with the passings of John Glenn and Vera Rubin. 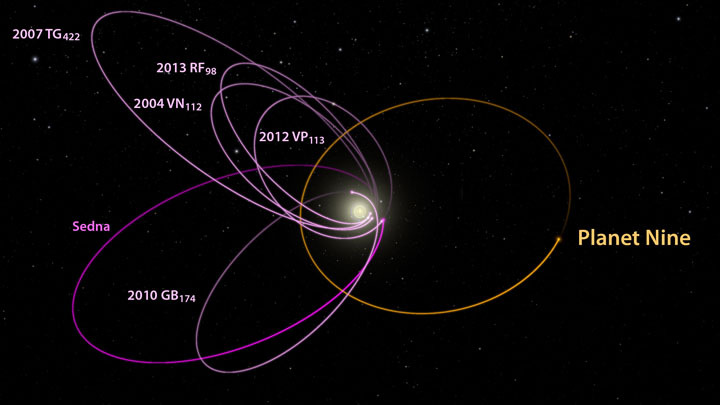 Orbits for the six most distant known objects in the solar system, whose orbits (shown in magenta) remain beyond Neptune), all align in one direction. A hypothesized massive "Planet Nine" (orange orbit) could be responsible for their perplexing alignment. It has been almost a century since Percival Lowell — the astronomer who predicted the existence of a “Planet X” beyond Neptune — died. But the hunt is still on. In January, Konstantin Batygin and Michael Brown (Caltech) presented evidence (in the form of slight orbital quirks among some of the solar system’s most distant objects) that suggests a massive planet, perhaps 4 times the size of Earth, lurks in the outer solar system. If true, the discovery would rewrite those kindergarten lesson plans. The detection of gravitational waves heralded a new era in astronomy — one in which scientists could study exotic and otherwise-invisible cosmic phenomena for the first time. As LIGO executive director David Reitze said during the announcement: “This was truly a scientific moonshot, and we did it, we landed on the Moon.” But unlike the race to the Moon, which abruptly ended in 1972, LIGO shows no sign of quitting: it has already detected a second black hole collision and begun another run of observations. Tabby’s star, or KIC 8462852, could be the result of a vast “alien megastructure.” At least that’s one astronomer’s explanation for its erratic behavior (and the reason the star made so many headlines in February). But the more astronomers monitored the star, the weirder it became. On top of the erratic dimming, it has gradually dimmed over the course of a century and a few years (both at different rates). And it’s these differing trends that leave astronomers scratching their heads. 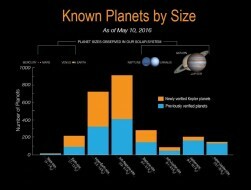 This diagram displays the number of known exoplanets by size. The blue bars on the histogram represent all previously verified exoplanets (including those detected by other methods and telescopes), while the orange bars on the histogram represent Kepler's 1,284 newly validated planets. In May, the number of known worlds beyond the solar system swelled. NASA’s Kepler space telescope increased its catalogue by an additional 1,284 worlds — the greatest number of planets ever announced at a single time. Although it brings Kepler’s confirmed planetary haul to more than 2,000 exoplanets, the list is nowhere near complete. With another year and a half of data to gather and 2,000-plus candidates still on the wait-list, more discoveries are likely to come. The Missing Satellite Problem is Solved? Astronomers have long wondered why the Milky Way doesn’t have thousands to millions of small satellite galaxies swarming around it, like bees around a hive. Simulations of galaxy formation predicted it should, but observations have only nailed down a few dozen dwarf galaxies. Then in May, astronomers added baryonic matter and physics to their models — instead of just dark matter and gravity (an assumption that works well on large scales) — and caused those extra galaxies to vanish. Not only may the new simulation finally put the cosmological mystery to rest, but it creates galaxies that are eerily real. It has been a rough year for dark matter. The newest searches for weakly interacting massive particles (WIMPs) have come up empty-handed. First, an underground detector in South Dakota called the Large Underground Xenon detector failed to detect any WIMPs. Then, the Antarctic observatory known as IceCube ruled out a fourth type of neutrino and dark matter contender. Physicists might soon be turning toward more exotic theories. In August, astronomers found an exoplanet that was both habitable and in the closest alien star system — two characteristics that made Proxima Centauri b’s announcement a once-in-a-lifetime discovery. Of course, whether the planet actually is habitable remains an open question. Because astronomers only know the planet’s minimum mass, orbital period, and distance from the star, they can’t say for sure. Still, it’s enough to encourage interstellar imaginings. The OSIRIS narrow-angle camera aboard the Space Agency's Rosetta spacecraft captured this image of comet 67P/Churyumov-Gerasimenko on September 30, 2016, from an altitude of about 10 miles (16 kilometers) above the surface during the spacecraft's controlled descent. The image scale is about 12 inches (30 centimeters) per pixel and the image itself measures about 2,000 feet (614 meters) across. On September 30th, the European Space Agency’s historic Rosetta mission to explore Comet 67/Churyumov-Gerasimenko ended with a crash — purposefully. For two years the spacecraft shadowed the comet through deep space, revealing an alien world of soaring cliffs, hissing jets of water, and even trails of organic chemicals. 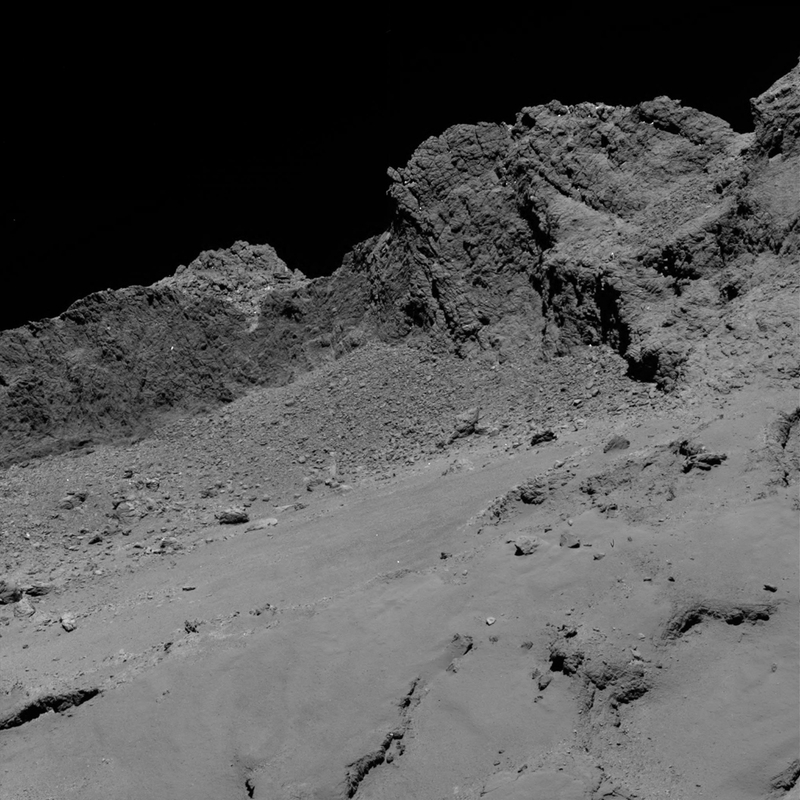 Still, those images don’t compare to the close-up views that Rosetta was able to capture as it descended toward its final sleep. NASA’s latest mission to the outer solar system sent back some gorgeous photos as Juno swept just 2,600 miles above Jupiter’s brown and white cloudtops. Although Juno was set to shorten its orbit from 53.4 days to just two weeks, an anomaly experienced by a set of valves that control the spacecraft’s fuel pressurization encouraged mission scientists to delay the change. 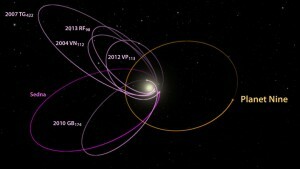 Today, Juno still orbits at its initial speed. But that hasn’t kept mission scientists from learning a few of the planet’s mysteries, like the fact that Jupiter’s bold, colorful stripes penetrate deep into its atmosphere. It was an eventful year for space missions. After a 7-month journey from Earth, the ExoMars Trace Gas Orbiter settled into its new home high above the Red Planet. Unfortunately, its lander, Schiaparelli, crash-landed into the surface after a fatal plunge. It was a particularly sad loss given that Schiaparelli would have been the first successful non-U.S. lander on Mars. Still, scientists remain hopeful that that will change in 2022, when the Russian and European space agencies attempt to land a rover intact based on the lessons learned this year. The first all-sky view released by the ESA’s Gaia mission shows stars in our galaxy – the Milky Way – and neighboring galaxies, including the Magellanic Clouds (lower right) and the Andromeda Galaxy (M31, lower left). Below Andromeda, the Triangulum Galaxy (M33) is also visible. 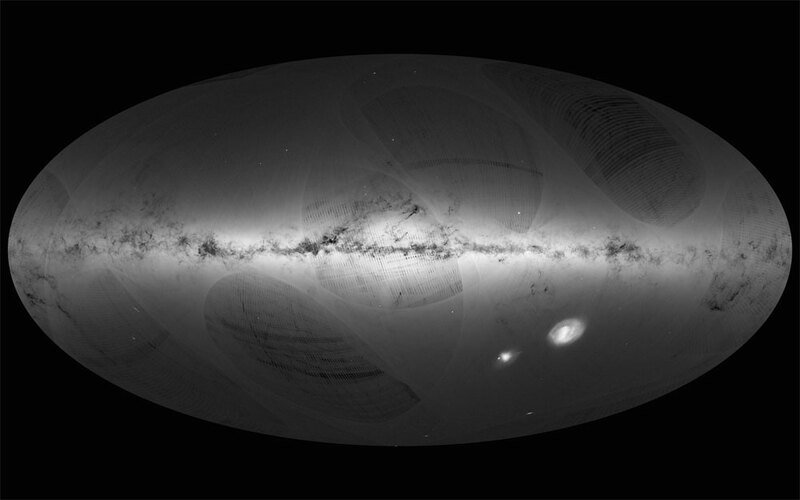 The supreme resolution of the full Gaia image enables astronomers to study individual stars. The curved features and darker stripes are artifacts due to Gaia’s scanning procedure. They will gradually disappear as more data are gathered during the five-year mission. In September, the Gaia spacecraft released its first set of data — a gold mine that 10,000 astronomers accessed on the first day alone. The excitement is understandable: by the end of its five-year-long run, Gaia will pinpoint the positions of one billion stars on the sky to an accuracy that’s hundreds of times better than today’s best catalogue. But there’s more: Gaia will also chart each star’s distance and two-dimensional velocity, creating a new, 3D map of the Milky Way. It has been over a year since NASA’s New Horizons spacecraft came face to face with Pluto and revealed a world composed of towering mountains, potential ice volcanoes, and even a bright patch in the shape of a giant heart. But the discoveries continued to roll in in 2016. Scientists determined that Pluto likely once had — and might still have — a briny ocean beneath its surface, that its atmosphere is far more dynamic than imagined, and that Sputnik Planitia caused its entire crust to shift as it filled with frozen nitrogen over time. The dwarf planet, which most scientists had assumed was geologically bland, couldn’t be more thrilling.